LIFE Cloning Gel is a rooting compound for plant cuttings. 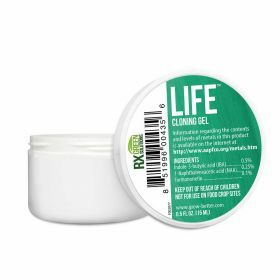 Containing a unique blend of rooting hormones and natural ingredients, LIFE Cloning Gel is formulated to produce roots in any substrate and works well with rooting cubes or aeroponic machines. LIFE's water based, non-toxic formula helps keep the plant healthy using natural antimicrobial ingredients and produces roots faster than its competitors. Unlike other cloning gels that use synthetic chemical biocides to protect from degradation, LIFE Cloning Gel uses Thyme Oil, a naturally occurring biocide. For best results, use LIFE Cloning Gel in conjunction with other LIFE products (LIFE Cloning Solution and LIFE Cloning Mist).